The chemical Bisphenol-A (BPA) has been making headlines lately. Consumers have been warned to avoid number 3 plastic as well as canned foods and even cans of soda pop. Back in October, though, Science News reported that cash register receipts also contain BPA, and that it’s present in higher quantities than other sources. The tricky thing about BPA in these receipts is that it’s “free” unlike with plastic. That means it’s not chemically bound, so it’s easier to get it on your hands. Although there is some debate about whether you can absorb BPA through your skin, it’s pretty much a no-brainer that once it’s on your fingers, you’ve got a good chance of ingesting it. Unlike in something like a plastic bottle, which contains nanograms of the stuff, BPA-containing cash register receipts can have 60-100 milligrams. To put that in perspective, one milligram is equal to 1,000,000 nanograms. Yikes! So how can we avoid coming into contact with BPA-laden receipts? There are a couple of precautions that can help. First off, not all receipts contain BPA. The type to keep an eye out for is thermal coated paper – the kind that’s shiny on one side. Regular “bond” paper receipts should be safe. There are two reasons that companies use BPA to make thermal paper: it allows the cash register to print the receipt without ink, since the ink is essentially part of the paper and BPA is the cheapest coating that achieves this effect. There is a company that makes BPA-free thermal paper receipts. Appleton Paper in Wisconsin sells receipt paper that uses a different chemical coating. You can ask at the store if they use Appleton Paper. If they don’t you could even express your concerns. Stores often take customer feedback very seriously. 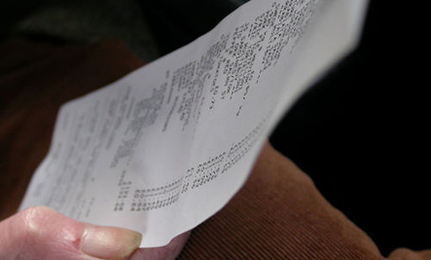 Not only is BPA a concern for shoppers, think about the clerks who handle receipts all day long! The easiest way to avoid BPA from receipts is to just not take one, but sometimes turning down the receipt isn’t an option. Maybe you paid with a credit card and need to sign or you have to document expenses for your business. In those situations, your best bet is to minimize your contact with the paper and make sure to thoroughly wash your hands before putting your fingers in your mouth or handling food. Children are especially susceptible to BPA’s effects, since their bodies are still developing. It’s probably not a good idea to let them handle receipts unless you’re 100 percent certain they’re BPA free. You might also want to wash your hands thoroughly between contact with a receipt and playing with children. Of course, some folks say that BPA is not harmful, and that the amount we encounter daily isn’t enough to be a concern. I’m inclined to err on the side of caution here, but that’s just me. What do you think? I don't even know why things that are known to be so unhealthy are allowed to be out there. My son told me about the receipts which seemed so insane but a lot of times I need my receipt. Sometimes the more you try to live a healthy life the more things pop up that are not healthy. I in addition to my buddies came looking through the excellent pointers located on your web blog and so unexpectedly came up with a terrible feeling I had not thanked the web site owner for those tips. All the boys happened to be for this reason stimulated to learn them and have in effect very much been taking advantage of these things. Many thanks for indeed being considerably accommodating and for picking variety of very good topics most people are really desirous to discover. My honest regret for not expressing gratitude to you sooner.